Could Humble Milkweed Replace Down Feathers In Your Outdoor Gear? Down is the most effective commonly-available insulator for outdoors apparel. But, it’s also expensive, loses its ability to insulate when wet (if untreated) and — there’s no way around this — is horribly cruel to most of the ducks and geese who donate their underfeathers. Now, there may be a real alternative: milkweed. Going back many centuries, humans have used down for its insulation and softness. The earliest recorded use of it as a commercial good is found on trade documents for a shipment from Russia to The Netherlands in the 1600s. And, what makes it good for geese and ducks is also what makes it good for humans. The chaotic shape of the soft feathers fills a massive area for their weight, creating trapped air that’s then heated by the wearer’s body. There’s several methods for harvesting down. The most humane style also produces the finest quality — Eider Down. Across Iceland, Scandinavia and Siberia, Eider Ducks are “farmed” by creating areas where they can safely nest on the ground, protected from predators. Eiders naturally shed down to insulate their nest, producing more down than necessary to keep the eggs healthy. Farmers simply collect that extra down through the incubation period. A single nest can produce about 20 grams of down feathers; it takes 50 or 60 to produce a single kilogram. Total Eider Down production worldwide is only a few thousand pounds each year. And that scarcity makes it expensive. Eider Down is desired because it has the highest fill power of any feather — 1,200. Fill power is measured by the volume 1oz of the feathers can loft into. So 1oz Eider Down lofts into 1,200 cubic inches. The higher the fill power, the more warmth you achieve and, all other things being equal, the lighter an item of gear using it will be. Other forms of down are industrially collected in a far less humane process. Most comes from captive geese, who are either raised specifically for plucking or, in China which is coming to dominate the industry with 70 percent of worldwide production, collected from birds slaughtered for their meat. That’s actually less cruel than the live plucking process, which sees the delicate undercoat of feathers ripped out of the bodies of live animals. This cruelty was the subject of a 2009 Swedish Documentary which claimed 50 to 80 percent of down was live-plucked and showed the process in graphic detail, including huge flesh wounds that resulted from pieces of the bird being pulled out along with the feathers. These wounds were then stitched up needle and thread without anesthetic and the injured birds were put back into production only to be plucked again and again and again. As a result of the documentary, Ikea, Patagonia and other brands have switched their product lines to cruelty-free sources. It’s unclear how much down production remains cruel. Watch your labels when buying a down product. The fill power and fill weight are sort of the horsepower and torque of the products, allowing you to gauge the performance of their insulation. A higher fill power down is better and more of it is warmer. Anything labeled as “100% Down” must only use down feathers. “Goose Down” must contain at lear 90 percent goose down and up to 10 percent of other feathers. If it’s simply labeled as “Down” it may contain an uncertain mixture of feathers (some of which aren’t down feathers) and synthetic insulation. As we discussed when Chris Mills jumped into a frozen lake, untreated down also loses all of its ability to loft and therefore insulate when wet. But, new hydrophobic coatings applied to the feathers like DownTek are able to help down retain most of its loft and insulation even when soaked through. From here on out, you should only by treated down for that reason. Allergic reactions to pure down feathers are rare, but the material provides and ideal home for dust mites. The eat human skin cells as we slough them off and may multiply to colonies of thousands over several years. Their feces spread through the air, triggering allergic reactions. So, if down is expensive, often cruel, can’t get wet and can trigger allergies, then why do we still rely on it so heavily? Simple: it’s lighter, more compressible, longer lasting and warmer than synthetic alternatives. Until now, there simply hasn’t been a better alternative. Before WWII, life vests were filled with a naturally buoyant material called kapok. But, when we went to war with Japan, we suddenly found ourselves cut off from its source, Indonesia. So, with new life vest production desperately needed, the government appealed to the only people who could help — children. “School children of America! Help save your father’s, brothers’, and neighbors’ lives by collecting milkweed pods,” read a pamphlet issued at the time. Over 11 million pounds of milkweed floss was collected by kids with pillow cases for the cause. Two sacks would fill one life jacket. Milkweed is a native plant that grows in abundance in North America, predominantly east of the Rocky Mountains. You’ve seen its distinctive seed pods taking to the wind in the fall, distinguished by their whispy white filaments. The name comes from the milky white substance that the plant secretes. That’s sticky because it contains latex, a substance which various people (including Thomas Edison) have tried to commercially source from milkweed with little success; there too little of it and too much other stuff to make it possible. What makes milkweed potentially valuable is the filament produced inside the seed pod. The plant produces this to help its seed propagate in the wind, but the hollow, waxy-coated fibers also have properties that make them nearly ideal as an insulator. It goes by a couple different names — silk, floss, coma, hair, etc — but you get the idea. 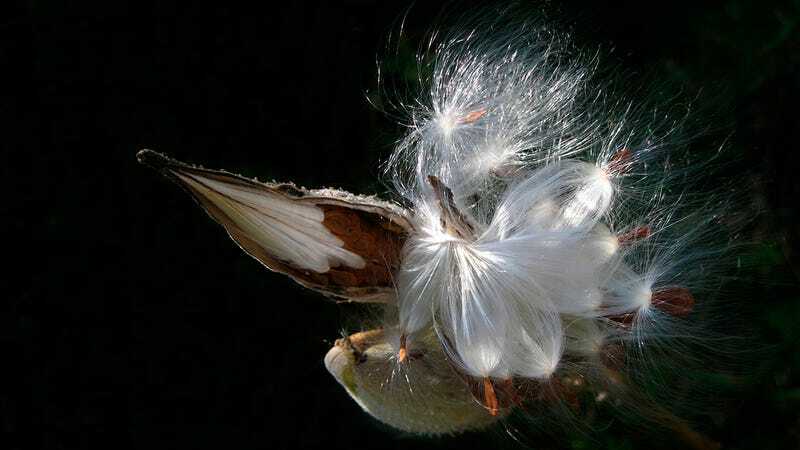 Its fibers are hollow, have a waxy, water-repellant coating and are light enough to float away on the wind while carrying a big milkweed seed along for the ride. Those hollow fibers trap air and the waxy coating prevents them from absorbing water. Properties that worked well in life jackets and should do equally well working as insulation too. Allergy suffers rejoice: milkweed is hypoallergenic and, when mixed with down, may eliminate that material’s issues with dust allergies. Naturally occurring across the continent, using milkweed for insulation is not new. It’s just never been industrialized. Survival-Spot.com recommends it as an ideal, naturally available insulator for long-term (i.e. post-apocalypse) survival scenarios and provides instructions for gathering and working with it. Apparently the fibers are best gathered in the fall, when you begin to see them floating through the air, and they need to be dried somewhere inside before stuffing them into jackets, quilts and the like. Milkweed is perennial shrub; cultivating it should be easy and economical. While that reduced cost is a major factor in milkweed’s favor, we’re looking for something better than down, not just cheaper. Tests show the woven material retaining all of its loft when wet, while providing superior insulation to lofted polyester. Another benefit of milkweed? Cultivating it could help monarch butterflies! Chlorophyll explained to us that they’re still in the early phases of R&D with the material and hope to refine it as they work towards a summit of Everest next year. The idea being that, if milkweed can keep their CEO warm at 29,000 feet, it should work for you too. Cheaper to produce than down, ethical and sustainable and hypoallergenic, waterproof and warm; Milkweed has the potential to be a true wonder material. The question now is: Who’s going to commercialize it first?